Sweet, spiced pumpkin yeast bread meets rich, dark chocolate in this twist on the classic babka. This gorgeous fall pumpkin chocolate babka bread is as delicious to eat as it is fun to make! In a large bowl, preferably one attached to a stand mixer with a dough hook, combine the warm milk, yeast, 1 teaspoon of sugar, and 1/3 cup of the flour and allow it to sit until foamy. Add in the pumpkin, butter, egg, salt, and spices and mix to combine. Add in the remaining flour, bit by bit, until completely incorporated, then knead for 5 minutes at medium-high speed using the dough hook of a stand mixer, until the dough is smooth. Cover the bowl with a kitchen towel or plastic wrap and set it in the refrigerator for 4-6 hours to give the dough a chance to rise at a cold temperature, which helps develop the texture and flavor. It will also make this dough easier to roll out. When dough is about ready to be formed into a loaf, prepare a 9-inch loaf pan by lining it with a parchment paper sling, which will make it easy to remove the loaf when it is done baking. Prepare the chocolate filling by melting the butter in a small saucepan over medium heat, then stirring in the sugar until almost completely dissolved. Remove from heat and add in the chopped chocolate. Stir until melted and smooth, then add the cocoa powder and stir to combine and form a thick filling. Take the risen dough out of the refrigerator and turn it onto a lightly floured surface. Roll it into a 12x20-inch rectangle and then spread the chocolate filling evenly across the dough, spreading it all the way to the edges. Roll the long edge of the dough into a tight log, just like when making cinnamon rolls, and pinch the edges closed. Use a sharp knife or pizza cutter to slice the dough in half lengthwise, Then with the cut sides facing up, cross one end over the other and repeat all the way down the length of the dough, keeping the cut sides facing up while wrapping the two lengths of dough around each other to form a rope or twist. Gently lift the twisted loaf and squish it into your prepared pan, tucking the ends under. Set in a warm place, covered with a clean towel, to rise for 1 1/2 to 2 hours or until almost doubled in size. While dough is rising, prepare the syrup by combining the water, sugar, and honey and bringing it to a boil in a small saucepan. Let the syrup boil for 4 minutes, then remove from heat and allow to cool to room temperature. Preheat oven to 375 degrees. 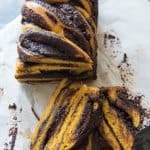 When oven is hot, bake the babka for 30 minutes or until a skewer inserted into the loaf comes out mostly clean (it's hard to miss the chocolate streaks so chances are it won't be perfectly clean. Remove the cooked babka from the oven and drizzle it with the room temperature syrup. I only used about half of the syrup and thought it was perfect but you could easily use more if you want to add more sweetness and have a moister babka. Wait until the babka is completely cool before removing it from the pan and slicing to serve. Recipe adapted from Sprinkle with Salt and David Lebovitz.